Been a few weeks since my last post. I went on holiday for 5 days to New York, which was very cold indeed upon arrival, about -10 with wind chill, the pilot said. Had a nice few days sightseeing and shopping there. I won't bore you with all the photo's, just one of Times Square with a Coca Cola Santa on the board. Got back a couple of days before the Stiperstones Seasonal Saunter having not run at all for about 10 days. I was working in London for a few days before going to New York and again in London as soon as I got back (straight off the plane!). So, as a result I couldn't pack all my running gear as I had limited room in my case. My gf drove me to the start of the Stiperstones event, which is in Shropshire, very close to the border with Wales. The village is amusingly called Snailbeach. I'd be interested to know how that got it's name, since it's nowhere near the coast! Upon arrival we had to bring a wrapped present (max value £1) to put in the bran tub. When you finished the event, you got to dip in and get a present out. Lots of people had Santa hats on etc; all very festive. It was a very relaxed event. It wasn't timed, and you could start any time you like between 8:30 and 9:00. There was some hot drinks and snacks available to eat at the time, and friendly staff on hand to dish them out. I hadn't got my GPS with me, so I was navigating totally off the written instructions and map. Thankfully both were excellent and I only made one navigation mistake all day. As a result, I haven't got my usual OS map screen grab to show you, but I did put together this approximation of the course in Google Maps. I did have it available to call upon my iPhone in case I got very lost, but I didn't need it and I wouldn't have been able to make use of it anyway, as you will read. We've had a cold snap in the last week or so in the UK, and it was around 0C and colder at times during the run. The course was mostly footpaths and fields. The fields were frost covered and "hard as iron" as the Christmas carol goes; especially tricky on the fields where the cows had been, as the hoof prints were all rock solid and made for a good workout for your ankles! The course starts with a long uphill, mostly on road which had turned to ice in place. In several places on the course, where we were on minor country roads, whole sections had turned to ice; 10's of metres at a time, which were tricky to cross. In a car they would have been really dangerous I imagine. My car would have had no chance on those roads. It's rear wheel drive, so there is no weight under the drive wheels, meaning it goes nowhere on even a slight incline on the ice. I took a couple of photo's after the descent from the first hill, in the early morning sunshine. The route then headed into the small village of Habberly before heading South. Much as I like my iPhone, it takes crappy photo's in comparison to my last Nokia and Sony phones. It's the latest iPhone model and still the camera is dreadful. It's terrible in low light, it doesn't have a flash either, and it really struggles to take sharp images anytime. Oh, and has one final fatal flaw. I have only a couple more pictures to show you because it was so cold the iPhone touch screen stopped working. The phone itself was fine, but the touch screen would not respond. Ok this isn't flaw unique to the iPhone (all touch screens), but when your "take photo" is a touch screen button, and not an actual button, you are stuffed! I took these photos just nearing the top of the second climb. One photo looking back down behind me, the other just ahead to the summit. It was then a jog down some of those quiet country lanes, with a little tentative walking over the icy stretches. Next was the last of 3 climbs in the first half of the course. This is where I made a mistake. Me and a chap I happened to be running near saw people on higher ground above us. Half way up the climb the instructions said to go straight through a gate. The other side of it was an electric fence. The chap convinced me that it was the wrong way and we should continue climbing to the top of the hill (pictured below) and not contour around it which is what we should have done. I tried to take other photo's after that one, but the screen had stopped working. We got to the top of the hill and sceptical I got out my compass. I took a bearing and said we are off course. We climbed over a barbed wire fence and headed over the where we both agreed we should be going. We started to head downhill and saw the runners who had been quite a ways behind us, all just ahead, so we knew we had lost time but at least were back on course. It was all steady downhill or flat for the next 3 miles to the first and only checkpoint at the half way stage. I suffered from a bad stomach again, and have determined this is caused by over-tight muscles in the stomach. Can't remember the name of the muscles. They are like a web over your stomach around to your back. Anyway, if they get very tight they can cause you to, well, simulate the effects of an upset stomach and need to toilet. Now I know what is causing this I can stop it happening. I just grabbed a piece of sponge roll at the CP and left straight away, so 10 seconds later and I was back on my way. I had reached that point in 1:49 despite the navigation screw up. I headed out on my own for the next few miles, so had to navigate it all myself; there was no one to follow. The route headed up the next hill past a farm where the instructions were a little vague, and a few other caught we up as I stood still wondering which way to go. One of the others had GPS, so he quickly resolved the question. There were a group of about 6 or 7 of us all in close proximity for the next few miles. I didn't trust the GPS instructions the other chap had, and headed a different way at one stage, one for the group of them to come back and join the right path later on. You can't place all your faith in GPS, as I have learned in the past! This time, the route description turned out to be more useful than following a line on a screen. We got fairly close to a winter partridge shoot; slightly unnerving with shotguns going off nearby, but we all escaped un-peppered! There was an amazing house with a great view. My iPhone screen had warmed up after some emergency skin on skin treatment, but sadly I mistook the lens being fogged for the screen being fogged so the only other pictures I took all came out like this. All fogged up.. oh well. I'd loosely teamed up with another guy who turned out to be very interesting. So we chatted as we ran. He was a fell runner who had done the Bob Graham Round and was on his 3rd Paddy Buckley Round attempt. If you don't know what either are, find them on the UK map of my website. The next section was a very long gradient, some of which we walked. The lack of miles in my legs (and the New York Pizza and Cheesecake!) in the last two weeks I certainly noticed, as I would usually have run it all. I was surprised that the route didn't take us over the actual Stiperstones themselves, but rather around them. This is understand is due to the very rocky ground around them. Some people did apparently go over them instead, which I wish I would have done as well. We reached the summit of the climb by the Stiperstones and enjoyed great views all around, and into Wales. It had been a very cold but beautifully clear day; perfect winter running conditions. We couldn't have asked for a better day really. The last couple of miles were all downhill and back into Snailbeach. 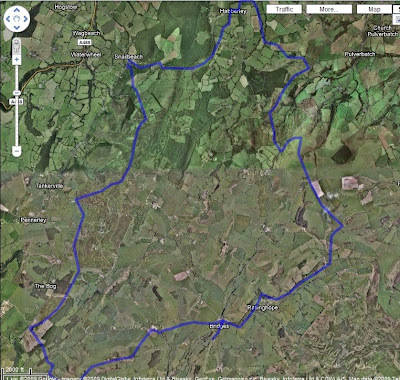 The route I recorded to be 19 miles, with about 3200ft of ascent. It took me 4 hours and 5 minutes, so that is around 4.5 mph average. Not too bad, but my form was definitely off a little. I won some scented (chocolate) candles in the bran tub, and sat down to the very well bite to eat. I had a jacket potato and a little chocolate cake afterwards. Thank you very much to the organisers and helpers. Another amazing value for money, and really well organised and staffed LDWA event. Other event organisers should go along and take notes! Caught up with my friends Anne and Vaughan at finish, and probably stayed for almost an hour having a chat, while I waited for my gf to come and collect me. Her car windscreen wipers have blown a fuse as they had frozen up when she tried to use them, so she had to wait for roadside repair. I went for a 10k run a couple of days ago, and I'll be running tonight (Christmas Eve), and I always do an early morning run on Christmas Day (I suspect it's subconscious; anticipating the calories of the Christmas dinner to come!). I hope to do an event on New Years Day as well.